After recently posting pictures for The Limited's latest collaboration; the Scandal Collection; I decided to check out the goods in person on the day of its debut. My local store window displays were entirely dedicated to promoting the new collection. 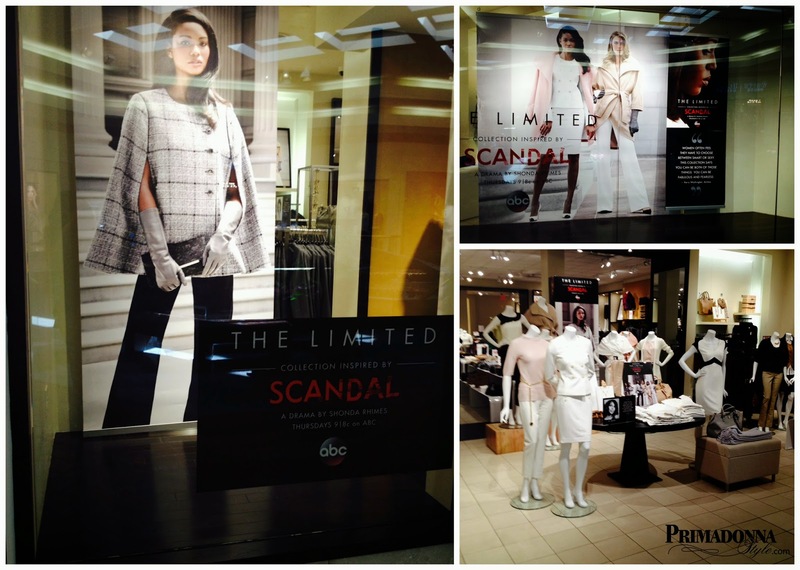 The majority of the front portion of the store was also dedicated to Scandal inspired collection. This debut was nothing like my recent experiences with designer collaborations at one of the major retailers. When Altuzarra debuted at Target last week, I walked in only four minutes after the store's opening to find many of the pieces in my size had already been snatched up and taken to the dressing room. I entered The Limited about thirty minutes after the store's opening and all was relatively quiet. An associate greeted me as I entered to let me know about the new collection. I told her I knew about it and I had actually come to check it out. There may have been three or four ladies in the store, but most were checking out the other merchandise being that the entire store was 30% off (except the Scandal Collection of course). The store was well stocked with all of the pieces I had seen in the lookbook pictures. 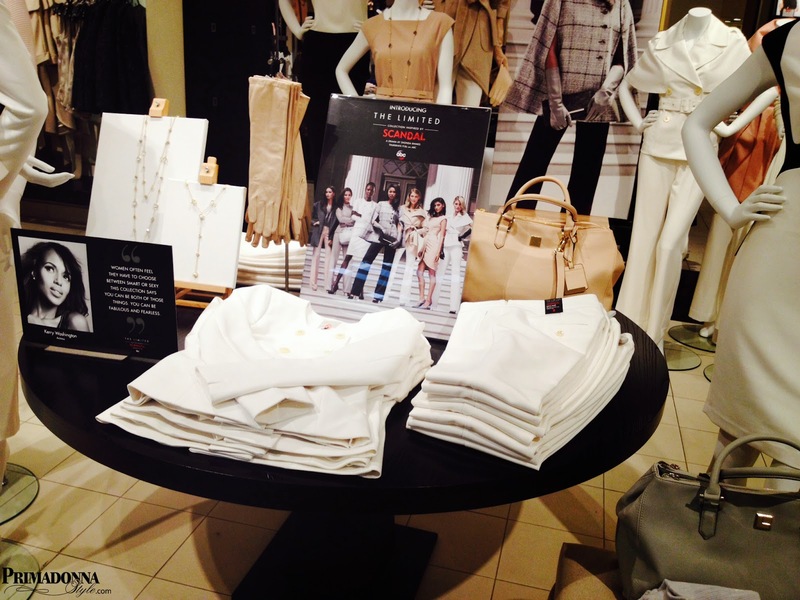 Everything looked very simple and elegant up close and very much like fictional character Olivia Pope's style. I decided to select a few pieces that I liked the most to try on and get a feel for their quality and fit. The dress was generous in size. I'm usually between a four and a six and I was able to wear the four comfortably. The dress was lined, the fabric felt weighty, the detailing was simple but well done, and overall a great fit. I tried the pants on in my normal size six and I was pleased with the smooth fit. Though they were slightly long (I was wearing heels while trying on), I was still impressed. The fabric felt heavy, the cut with the slight flair was very flattering, and if they weren't $98 I would have purchased them. I ran into another lady in fitting room who was also going crazy over these same pants, but we both ended up not getting them due to the price. If you got the dough girls, I say these are great quality and a good purchase. The tie neck blouse also fit in my normal size small. Though the style is pretty basic, the blouse compliments the pants perfectly. 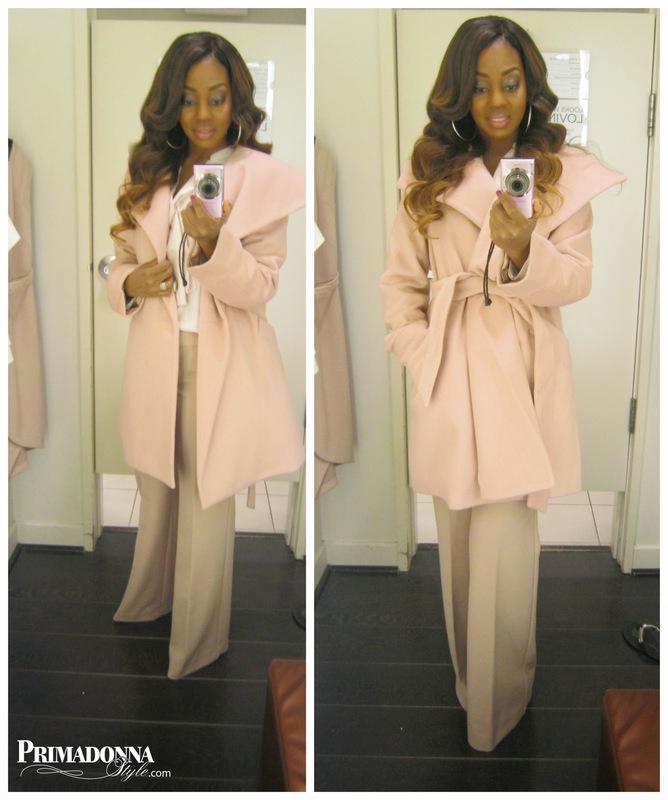 I'm a big fan of blush tones and this outfit was my favorite of everything I tried on. I loved the blush tie neck blouse with the blush toned slacks, but topping it with this soft pink wrap coat made it absolute perfection. The fabric was soft and not itchy at all. 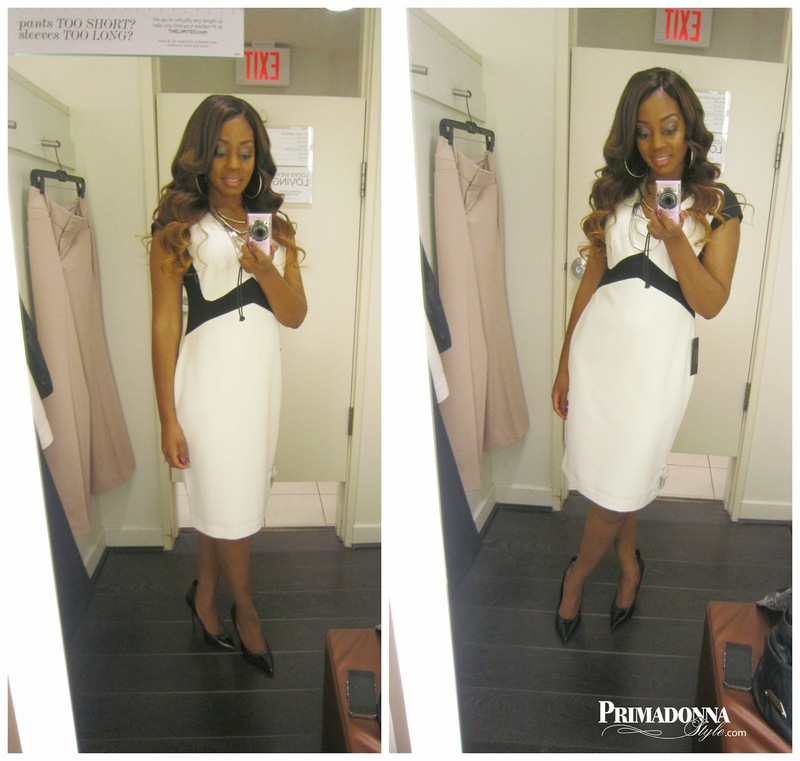 This entire ensemble had me feeling fabulously feminine white still looking professional. I own two pink coats already, but if I didn't, I would seriously consider this one. 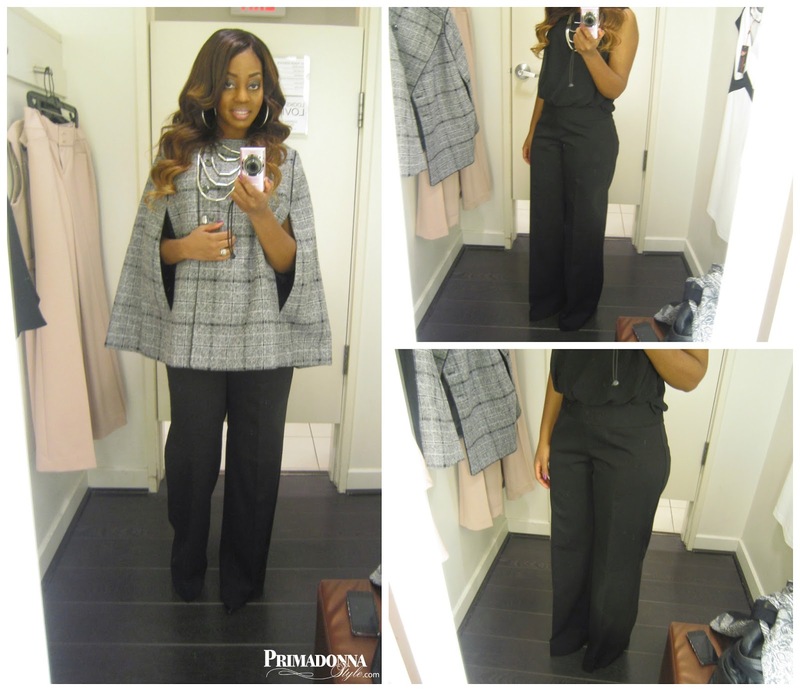 I chose a size small in the cape trench coat and a size six in the pants, both my normal size. They both fit perfectly except for the slightly long length of the pants (I was wearing heels to try them on). This outfit, like all the other pieces I had tried on thus far looked and felt like a quality garmet; but I didn't care for it. Though it's not to my personal taste, I think it would make a lovely professional ensemble for an older demographic. Like the Liv Trousers, I liked the fit of these pants. My normal size fit well, and I noticed the Olivia Trouser didn't seem to be as long as the Liv Flair Leg Trousers. The plaid cape reminded me of a black cape that I already own. Once again this is a great quality ensemble, and perfect for the right professional lady; just a bit to boring for my taste. I think the leather gloves seen in the lookbook pictures would definitely jazz up this look. I was able to take the size 4 in this dress, and it was still a bit loose; especially in the bust. It would seem that the dresses run slightly big in this collection. Like most of the pieces, it is simple, elegant, and would flatter a variety of body types. As a fan of the show Scandal (I have seen EVERY episode), this was exactly what I would imagine Kerry Washington's character Olivia Pope wearing; feminine professional pieces that showcase a simple confident style without being fussy or overdone. I was pleasantly surprised at the high quality look and feel of all of the pieces I tried on, but that quality is definitely reflected in the prices. I would have purchased some of these pieces if they had been at a lower price point, but I'll be keeping an eye out for a sale in the future. 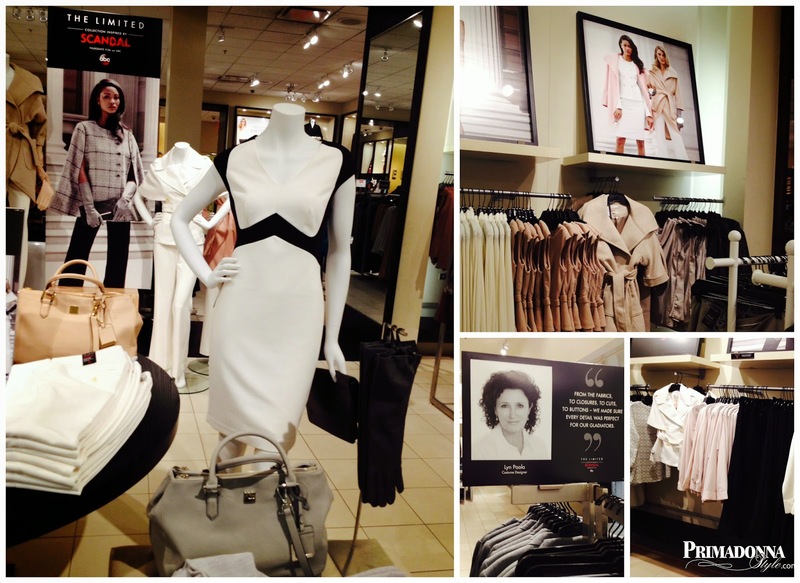 Will you be shopping The Limited's Scandal Collection? Wow, you look gorgeous in all of it! The pink coat and white cape trench are my fave. So expensive for now though! Great review girl! Love the pink coat and the cape! Thank you for sharing. I heard about the line, and haven't had a chance to check it out. The entire pink outfit was amazing! My favorite. Thanks for stopping by! I usually wear a small, and the small fit perfectly. You dont't want it too snug since it will be layered over other clothing.